When it came to cars, General Motors was the undisputed king of the mid-century road and the American Dream was paved with Chevys. Despite the fact that by the mid 1950s more and more suburban families were buying a second car, in 1957 we were still a one car family. Once considered a luxury it was now a necessity for suburban living, just one more component of the American Dream. Besides which the one car which we did have , did not have automatic transmission making it very difficult for my mother to drive. Piling us into our 1954 green Chevy Skyline, Moms nerves were already frayed. As my brother and I tussled with one another in the back seat, Mom fumbled with the keys as the motor spun and choked, then burst into an over accelerated roar that seemed to be a part of the roaring in her head. All over the neighborhood mothers would be piling their tots into cars and heading out to do errands. As the other mothers raced off in their massive power- flyte, dyna-flow automatic transmission enabled automobiles, mom was stuck in the driveway, the engine flooded. She clenched her hands on the steering wheel. She had stalled the motor and she started it again grinding the gears when she tried to shift too hurriedly. You had to use the clutch to change between high and lows. How could Dad have been so foolish to buy a car with a clutch, she fumed to herself. Despite the fact that by 1954 automatic transmission was installed in almost half the new cars, budget conscious Dad had surprised Mom and had gotten one without it. Our much maligned Chevy had been Dads dream car. He often talked about the time when they had been shopping for their first new car and were wowed by the spectacle of the 1954 GM Motorama. 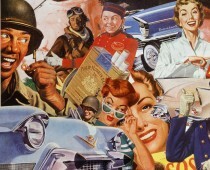 It was nothing short of a pageant to post war prosperity and optimism. Nothing exemplified pizzazz in Detroit during its glory years more than GM’s extravagant Motorama, a traveling auto show that ran from 1949-1961 showing off flashy and elaborate automotive designs of tomorrow. 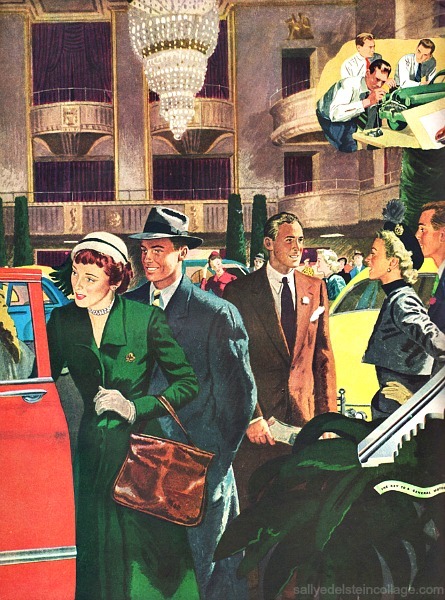 That year Mom and Dad joined the opening crowd of 30,784 of well dressed folks who gathered eagerly at the Grand Ballroom of the Waldorf Astoria in NY for the thrill of seeing a glimpse into a future filled with plastic, steel and chrome. General Motors put on quite a show. Along with the 27 piece orchestra with chorus providing background music for the 6 shows each day , the crowds were entertained by fashion models, a Broadway cast and wide screened movies. But the stars of the show were the cars. Displayed on elevated turntables were the dream cars with futuristic designs. Chevrolet’s fabulous concept car, the Corvette Corvaire and Corvette Nomad were the undisputed divas of the show. It was hard to tell who the men were ogling at more, the shapely models or the Chevy Corvette, the first fiberglass sports car. 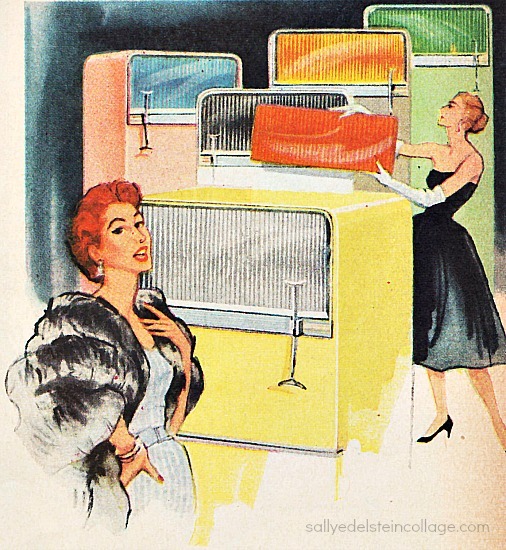 Lest the ladies feel left out of this lollapalooza of fun, Frigidaire, a member of the General Motors family, displayed all their latest dream appliances for m’ lady’s pleasure. Besides oohing and ahhing all the frost- free wonders, it was a car that caught Mom’s imagination. With visions of suburban togetherness dancing in her head, Mom was swept away by the Corvette Nomad Station Wagon. As the beauty revolved on its Motorama turntable , the noble Nomad heralded a generation of stylish luxurious station wagons. It’s dream styling contrasted with work-a-day wagons and “were just about the best way to haul groceries and little Leaguers in the daytime and arrive at a posh country club at dusk”, the salesmen boasted. My parents left the show their heads filed with dreams, only to crash back to earth a few months later when Dad pulled up the driveway with a car Mom could never really drive. By 1957 Mom was ready to shift gears both mentally and move forward. Now the Chevy seemed old fashioned. Its dowdy, streamlined shape, all round curves and bulges seemed from another era . For the new fall season she wanted her own car.